Published: May 11, 2015 at 06:42 p.m. Updated: May 12, 2015 at 01:24 p.m. If Tom Brady serves all four games of his suspension for violating the NFL policy on the integrity of the game, the Pittsburgh Steelers and Dallas Cowboys will be among the teams that benefit. The Super Bowl champions aren't nearly as daunting without the services of the most successful quarterback in NFL history. The Steelers, minus suspended superstar running back Le'Veon Bell, were chosen as the sacrificial lamb for the NFL's season opener in New England. Now Pittsburgh has a major competitive advantage at quarterback, sending Ben Roethlisberger up against first-time starter Jimmy Garoppolo. If the Patriots manage to squeak by the Steelers, they travel to Buffalo to take on a suddenly stacked Bills squad. No one dials up the pressure against New England's offense like defensive strategist Rex Ryan. Unless Brady's suspension is successfully appealed, Garoppolo's next start will come versus the Jaguars at Foxboro in advance of the Week 4 bye. Coming out of the bye week, the Patriots will head to Dallas to face the reigning NFC East champions in the final game without Brady. Much like the Week 1 matchup versus the Steelers, the Cowboys will have a decided edge at quarterback. Although Pittsburgh won three of four games during Roethlisberger's 2010 suspension, New England faces an additional obstacle. The Patriots have struggled out of the gate the past few Septembers, experimenting with different combinations at wide receiver, running back and the offensive line while seeking an identity for the rest of the season. 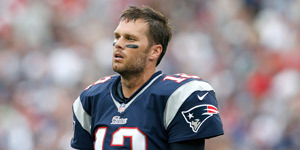 If Brady misses a month, will that tinkering extend into October? One thing we can say with certainty is that there will be plenty of eyeballs on Brady's Week 6 return, which will be featured on Sunday Night Football versus the Colts -- the team that alerted the NFL to the Patriots' deflated footballs in advance of the AFC Championship Game.